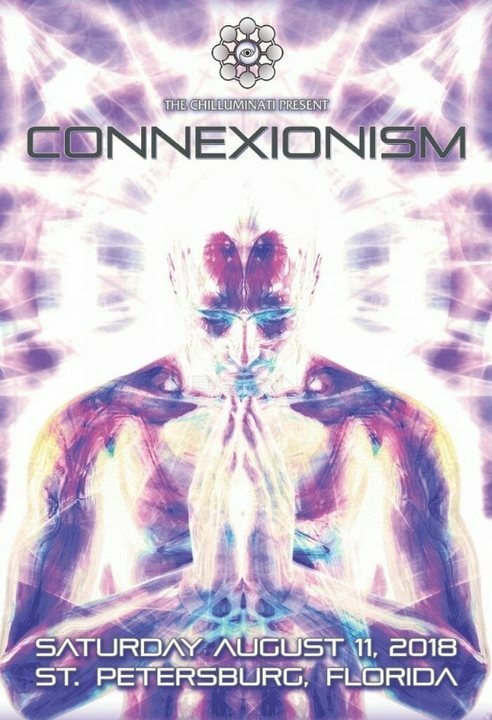 Connexionism is an all-night psychedelic and goa trance music event located in a commercial+industrial district near downtown St. Petersburg, Florida. Admission is restricted to ages 18 and up and there will be strict ID checks at the door. We encourage you to purchase pre-sale tickets to guarantee admission and to save a few bucks. R.O.A.R. (or Right Of Admission Reserved) is in effect for this event. This means that your participation is voluntary and at our sole discretion. The Chilluminati and The Movement Sanctuary staff reserve the right to refuse entry or make anyone leave the event at any time for any reason, or no reason. Connexionism IS A LEAVE NO TRACE EVENT. This means that you are expected to pick up after yourselves and help us return The Movement Sanctuary to its owners in the same, IF NOT BETTER, condition than it was when we arrived. We’ve hosted events all over the Midwest USA for 13 years, and we’re excited to return to the Tampa Bay area! Invite your friends, try something new, help us grow! The Movement Sanctuary is a training center located in Downtown St. Petersburg, Florida. We offer a unique variety of movement-based workshops, classes, private lessons for all levels focusing on spirit, mind & body. Whether you’re looking for a fun new workout with an inspiring group of people or training for a performance, we provide a safe facility for you to call home. Our 7,000 square foot warehouse has 35-foot ceilings for aerialists to fly in and soft mats for acrobats to land on. Outside you can find a relaxing outdoor area with hammocks, a fire pit & stage for small performances. We embody a diverse range of art forms and encourage communal efforts to create a completely unique experience. Our space has quickly become a sanctuary thanks to the support and helping hands of the St. Pete community.